The near-simultaneous rise of interest in open source and open access in the context of academic libraries has made these concepts ripe for confusion. Adding to the confusion is the presence of projects that are both open source and open access. Rather than cringing in silence when these terms are used interchangeably, I’m hoping to clarify the conversation. Note: I’m not an expert in either concept, so please feel free to research more and/or to add your comments. Open source refers to exclusively to software. It means that the source code for that software is openly available, thus allowing for modification, and that the software may be redistributed freely. (As a side note, the related term “free software” refers to the users’ freedom to copy, run, distribute, and modify software, rather than meaning free of cost.) Much open source software is free of cost, but some applications do carry licensing fees. If, as a library, you care about purchasing software to which your programmers can make modifications on the back-end, then use the term “open source.” But if all you really want is to use something that doesn’t cost you anything, just say so. There are several reasons why open access is such a hot topic in academia, and specifically in libraries. First, it addresses intellectual rights issues (hence the “unrestricted” part of the definition). Since authors typically relinquish their copyright for published works (more on this later), many interpret copyright law that they do have the right to use that work (in its entirety) in the classroom. (This is part of the ongoing debate of the meaning of the “fair use” doctrine.) Open access, often in concert with Creative Commons licenses, makes work available for access, copying, distribution, and reuse. Second, as library budgets continue to decrease, the cost of purchasing published research is skyrocketing. Publishers continue to raise journal subscription rates, causing academic libraries to make tough choices about what to keep and what to cut. That limits the research to which their faculty have access. Third, when academic libraries subscribe to journals, many times they are effectively “buying back” the research performed by their institution’s faculty. The markup and re-selling of that knowledge by publishers is increasingly looked upon by academics with a skeptical eye. Thus, libraries are turning to scholarly repositories (where faculty can store and share pre-printed versions of their research) and open access publishers to find new models for disseminating scholarship. Open access is commonly referred to as “free” access, but that’s only part of the story. Usually someone does have to pay something to store, host, and share information, even when it’s not distributed in print format. With open access, these costs are not born by the consumer (the public)—instead, there are a few different models of who pays the costs. In the gold model, either the publisher or the author pays the publication cost up-front to make the work freely available in a journal. In practice, author fees are often paid by research grant funds, academic departments, or libraries, but may be paid by the individual. Increasingly, the journals themselves have adequate funding and do not require author fees. 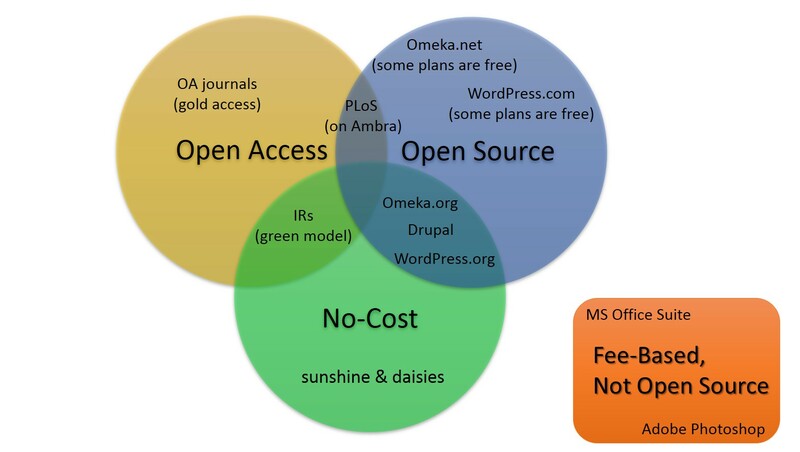 So while open source and open access are different concepts, they are related in their dedication to openness, and they sometimes overlap in a single project. For instance, PloS (Public Library of Science) is an open access journal (gold) that is hosted on an open source software platform (Ambra). You can find more examples of OA publications and IRs at ROAR and SHERPA/RoMEO. I know this post is old, but I just read it for the second time today, and I feel compelled to add that open source does not necessarily mean that “programmers can make modifications on the back-end” since that depends on how the code has been licensed. However, it always means that you can see the code, and thus, you are much more likely to be able to design homemade tools to work with the open source software. Open source also supports various digital stewardship activities (with closed source software many of these activities are impossible). I really appriciate your outline of different kinds of OA and your work to distinguish these oft-conflated terms. I'm a Las Vegas-based, Texas-bred academic librarian (Director of Planning & Assessment at UNLV), with a PhD in Higher Education. When not researching (ha! ), I'm traveling, hiking, writing, photographing, geeking out, painting, reading, & discovering new hobbies.